Building a closet in your attic is a simple way to attain more storage space. As home renovations go, this is one of the easiest, though it does require basic carpentry and finishing skills. Attic configurations vary, but the vast majority have a pitched roof that tapers down on both sides, which is the primary feature dictating the location and layout of the closet addition. The best place to position your closet is along one side of the pitched roof so the closet door will be at the point where the roof rafters are between seven and eight feet above the floor. You can build the back wall of the closet as far back as you want, but for the sake of practicality, there is little reason to go beyond the point where the rafters are less than three feet above the floor. Some attics have a knee wall (a structure to support the rafters) in roughly this location, which forms a convenient rear wall for the closest. Though the depth of the closet is fixed by the pitch of the roof, there is no limit to the width (but see below concerning existing ventilation systems). The simplest approach is to use a size that corresponds to the spacing of the floor joists as these will form the structural support for the closet. The joists will either be 16 or 24 inches apart. As long as you're not going to store extremely heavy items in the closet, the existing floor joists should have no problem supporting the weight of the closet, as long as they are structurally sound. But there are a few other critical points to be aware of before getting started. Ventilation - Plan your closet in a location that does not cover or impact existing ventilation systems. Insulation - If your attic is not already insulated, you may want to consider insulating the closet space, depending on the climate and what you will be storing. In this case, plan on removing the existing insulation on the floor of the attic under the closet area and adding insulation to the walls and ceiling of the closet as it is built. You can also add a vent in the closet floor to allow room temperature air to flow in from the room below during the process if desired. Access flooring - If the attic does not have an existing floor, you will have to install one over the joists, at least to cover the area between the point of access to the attic and the location of the closet. Lighting - You will need a licensed electrician to run wire to the closet ceiling area and install a junction box for the closet's light source. 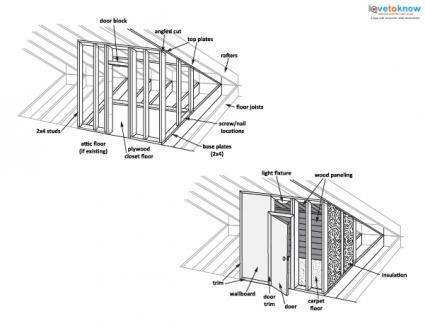 For the sake of simplicity, the plans and project instructions are based on a 4 x 8 foot closet, as it allows a single sheet of plywood to be used for the floor and the dimensions line up with both 16-inch and 24-inch joist spacing. It also makes the math easy for positioning the studs of the closet wall. Click to download the attic closet plans. 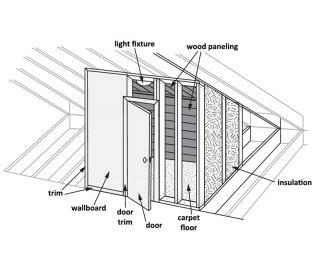 Follow these basic steps for framing and finishing an attic closet. Modify them to your own attic as needed. Nail a sheet of plywood to the existing floor joists so the short sides align with the joists and the long side is perpendicular to the joists. Cut 2 x 4s to the fit the length and width of the plywood and nail them flat on all four edges of the plywood as a base plate for the studs. Set the blade on a circular saw to 1-1/2 inches and cut out a section of the 2 x 4 in the location of the door, accounting for the width of the door and the door jamb, and remove this section. Using a 2 x 4 with a level taped to it, mark the roof rafters for the top plates (directly above the base plate on the two long sides). Cut the two top plates to the same dimensions as the front and back base plates and nail them to the rafters in the proper position. Cut eleven 2 x 4 studs that will be used between the base plate and top plate in the front and back side of the closet. One end of each will have a square cut and the other end will be cut on an angle corresponding to the pitch of the roof. Toe nail the studs into position every 24 inches perpendicular to the base and top plates, starting with one in each corner. They will need to be set in 3-1/2 inches from the ends of the plates; then add three rear studs evenly spaced between the rear corners. Add a stud 24 inches toward the middle from each of the front corners and then add a pair of studs at the end of the base plate on either side of the door opening. Cut the six studs that will be used for the shorter walls and install one on each of the corners (set 3-1/2 inches in from each corner) and one in the center of each wall. These studs will be nailed to the rafters and will probably need a combination of notching and blocking, depending on the position of the rafters. Cut two additional 2 x 4s for the doorframe and nail these to the studs on either side of the door opening. They will require an angled cut at the top to meet with the top plate and will sit on the plywood, rather than the base plate. Cut a 2 x 4 to the width of the door opening and install it horizontally between the door framing at the appropriate height for the door, allowing space for the door jamb. Install door jamb, door, and door hardware. Cut the wall material (Sheetrock, beadboard, paneling, etc.) to size as needed. This design allows several 4 x 8 sheets to be used whole though others will need to be cut to match the angle of the roof and to fit around the door. Screw it into position around the exterior of the framing. Staple insulation into place between the studs and rafters if desired. Install wall material around the interior of the framing. Cut out the portion needed for the light fixture. Install light fixture or have it professionally installed if you do not have the skills or certifications. Install floor covering inside the closet, if desired (carpet, wood flooring, linoleum, etc.). Install baseboard, door trim, and any other trim or moulding desired. Paint the walls or finish as desired. Install clothes rods and shelving. There are many ways to renovate an attic to increase the usable space in your home. If nothing else, adding a simple closet will at least give you a bit of clean, organized storage space and is an inexpensive project that can be completed in a single weekend.